Ha Giang town is a long way from Hanoi (about 300 km). Ha Giang province (Hà Giang) in northern Vietnam is less frequented by tourists. Ha Giang is the place where almost 90% of the population are ethnic minorities with their own cultures and lifestyles. Ethnic minorities create a unique and rich cultural heritage of the area. Traditional practices and habits of these ethnic groups are very diverse and interesting, and they attract many travellers who have a chance to explore these unique aspects. 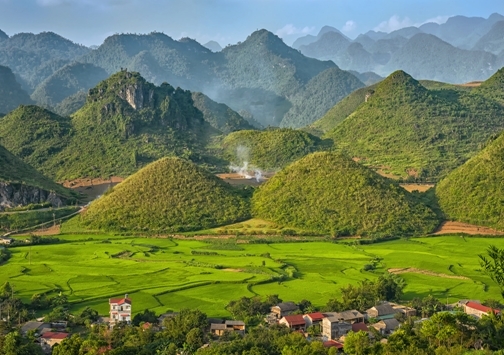 The farthest and the most beautiful place of Ha Giang province is Dong Van Karst Global Geopark, designated by UNESCO as one of 77 sites with the important geological and cultural heritage. This geopark is littered with the ethereal karst formations that are nearly 400 million years old, and has two protected areas. The best time to be in Ha Giang is in the dry season, in the months from October to April.